The Accademia del Belcanto “Rodolfo Celletti” of Martina Franca, promoted and organised by the Fondazione Paolo Grassi in collaboration with the Festival della Valle d’Itria, was founded in 2010 with the aim of providing young opera singers with highly specialised training in specific aspects of the technique, style, and performance of Italian Belcanto (from Monteverdi to proto-Romanticism), as well as analysis and study praxis in the different fields of Western music theatre, including the various expressions of contemporary music. The course is articulated in several laboratories for performance practice, applied to Belcanto’s specific techniques and aesthetics: from seventeenth-century “recitar cantando” to expressions of the Apulian/Neapolitan school; from the technique of coloratura to the art of variation in the Italian belcanto tradition of the 1800s. Specific practical experiences organised during the Festival della Valle d’Itria will enrich the students’ training, and made all the more precious as they will be taught by top-class coaches, performers, and directors. The training plan also boasts a specific section specialising on Baroque Belcanto, with prestigious master-classes and one-to-one lessons for those young performers who are particularly interested in and inclined towards this kind of repertoire. The specialised and personalised study is all the richer for the work experiences lined up during the programme of the Festival della Valle d’Itria. The course for opera singers goes side-by-side with a course for maestri collaboratori, for young pianists wishing to actively participate to the lessons, and to the productions of the Festival during the phase of work experience. The course is dedicated to the training of Maestri Collaboratori , who will build awareness also in relation to the specific necessities of the singing techniques, and to the characteristics of opera theatre, with its dramatic and musical values and the professions connected to it, so as to favour an efficient inclusion into the professional world. 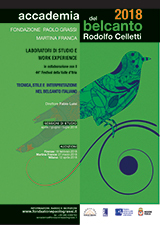 The study programme includes classroom lectures on theory and technique, as well as work experience activities in collaboration with the Festival della Valle d’Itria. Fabio Luisi , music Director of the Accademia del Belcanto and of the Festival della Valle d’Itria, will coordinate the activity of internationally-renowned coaches and performers. Coaches: Marco Beghelli, Stefania Bonfadelli, Domenico Colaianni, Giacomo Ferraù, Sara Gamarro, Luca Gorla, Antonio Greco, Renata Lamanda, Cristina Liuzzi, Sherman Lowe, Fabio Luisi, Ettore Papadia, Iacopo Raffaele, Giorgio Sangati, Carmen Santoro, Roberto Servile, Vittorio Terranova. The course for Maestri Collaboratori is dedicated to candidates in possession of the artistic qualities and an inclination for the profession, as well as a general preparation on theory and technique such as may benefit from perfecting and hands-on experience, with a view of facilitating the inclusion into the working world in the field of opera theatre. Courses are free and with limited enrolment; admission is subject to a selection. There are three places for maestri collaboratori. The candidates who have not been selected may step in in the event of the selected candidates’ withdrawal. The Board will select the candidates on the basis of their qualifications, and after having passed an audition, which will be held in Martina Franca at the Fondazione Paolo Grassi (main venue of the Accademia) onTuesday 27th March 2018 at 5pm. The decision of the Board is final. Further details on the convocation to the audition will be communicated directly to the enrolled candidates. - in possession of a Diploma, or a three-year- or two-year piano course qualification at a state Conservatoire or equivalent Music Institution. Qualifications obtained in foreign institutions will be considered only if equivalent to the above. Candidates with professional experience as piano accompanists for opera singers will be at an advantage in the selection process. The Board reserves the right to grant access to the course to pianists who have shown particular artistic merit during music productions, competitions, or ex-tempore auditions. The subject of the e-mail must read “ Iscrizione audizione per Maestri Collaboratori”. In the same e-mail, candidates must also indicate the repertoire chosen for the audition. • an aria taken from an opera by Alessandro Scarlatti or Georg Friedrich Händel. We also require first-sight reading of opera extracts from the Italian opera repertoire, chosen by the Board. The examining Board has the right to listen to the whole or part of the programme indicated on the application form. Attendance to the course is mandatory, in the days and times established together with the coaches. At the end of the course, once the verifications of the attendance and participation are complete, the attendees will receive a certificate of attendance. The lessons will take place at the headquarters of the Fondazione Paolo Grassi in Martina Franca. The work experience will take place in the venues of the Festival della Valle d’Itria, as well as in the offices mentioned above. The staff of the Fondazione Paolo Grassi and the Management of the Accademia may, upon necessity, provide advice and indications for accommodation at corporate rates.